Meet time: 8:00 a.m. Note the earlier meeting time! Strava reports about 4,100 feet of climbing for this route. There's a lot of climbing on this ride, some of it a little bit steep, but none of it stupidly steep. We've rated this ride a terrain "4" because the climbs are long, not because they're unusually steep. Your facilitator rode the entire route in November and wasn't grumpy at the end, so you can do it, too. We'll have at least one SAG vehicle to keep us company, especially in the remote areas where cellphone service is not reliable. RSVP now RSVPs are requested but not required. Except maybe for just a little bit too much wind, you really couldn't ask for a finer winter day for riding almost 60 miles. And our group of 51 intrepid riders handled the route and the conditions with skill and grace, with no major issues or incidents all day long. Terri and Ken, our wonderful SAG drivers, helped with a couple of flats (and transporting our more-than-ample supply of Girl Scout cookies), but we were again fortunate that their services were not needed for anything more serious. Today's new piece of the challenge was the wind. As we move closer to spring, winds typically pick up in the Bay Area, so we'll be dealing with this more often. And the California coast in June can be very windy indeed. This is why we generally travel north to south: We get to take advantage of a prevailing tailwind on much of the ride. But there are segments where we travel in other directions ... and, as happened on part of last year's ride, freaky weather can reverse the wind direction and give us unexpected headwinds or crosswinds. Another skill that becomes more important with every ride is pacing yourself. At 60 miles and above, most of us can't treat these rides as sprints. This also means that many of us probably shouldn't be striving to set speed records on extremely long training rides. I'm quite guilty of this; I wrote recently in my blog about the "Strava effect" and how training based in social networks can both help and hurt. Today, we had more than 23 miles between rest stops 1 and 2. That was a lot, and at least some of us (including me) were getting a little bit worn out by the time we reached Portola Valley. Now, imagine that feeling during a seven-day ride. You don't want to be there! Again, the secret to ALC happiness (and endurance cycling in general) is to find a pace that you can essentially maintain forever ... and then stick with it. Some other riders will have a faster pace; some will be slower. That's fine. You need to make it your ride. Knowing that you're just 15 miles away from the end might make you want to go faster to get a ride over with. But doing so might just make you more unhappy instead of less. Stick to, as longtime rider Doreen Gonzales says, your "happy gear." One interesting situation happened today, and it was partially my fault. For the first time that I can recall in six years of leading training rides on the Peninsula, we had three official ALC rides sharing parts of the same route at the same time. (This is a very encouraging development!) But I didn't mention this before our ride-out, mostly because I was lazy and forgot to check where the other rides were going today. Just about everybody is doing a great job of following the all-important ALC safety rules. That means I can delve a little more deeply into some of the finer points of the rules and talk about how things work in the real world compared to on paper. Case in point: "Keep at least one bike length between you and the rider in front of you." We know it, we know why it's a rule, and we generally obey it. But it's hardly a secret that this isn't always the case. We certainly don't do pacelining (really! ), but we often find ourselves in a position where we're a little bit too close to the rider in front of us. That happened to me this morning, and something bad almost happened because of it. The rider in front of me kicked up a small rock from the surface. (Such things just happen; it most definitely wasn't the rider's "fault.") The rock traveled perpendicular to our line of motion, making a harmless "ping!" against the side of a passing car. But it just as easily could have gone backwards, toward me. That would have been bad, especially because I probably wouldn't have had time to react. And sometimes, "one bike length" simply isn't enough. (That's the "at least" part.) Think about when you're descending at 30 or 40 mph; you need a lot more distance to react. It's just like when driving a car: You need reaction time, not distance. As with most other things, use common sense. Always give yourself time and space to react to unexpected events. Remember that, in June, you'll be sharing the road with riders of all different skill and experience levels, and some of them might do things that seem plain stupid and unexpected to you. What's next? In two weeks, we're going on an all-new route for the Distance Training rides. 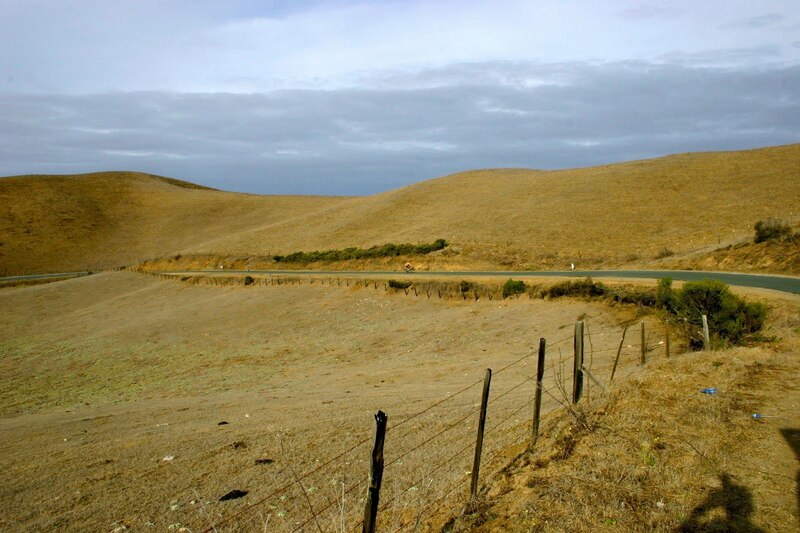 We'll head to south San Jose and climb Metcalf Road, which is listed in Strava as 1.7 miles with an average grade of 10.6%. Compare that to Westridge from two weeks ago, which was 0.7 mile at 10.6%. The views, however, are well worth the effort, and climbing Metcalf will take us into some unusually remote territory that feels completely different from most of the other places we ride. Also, Metcalf is the only significant climb of the day, so the rest of the 69-mile route should feel quite tame by comparison. Find out more and RSVP here. The Metcalf ride is our last ride of the season that will have a 9:30 a.m. meet time; subsequent rides will start getting progressively earlier, usually 30 or 60 minutes earlier each time. (I have to do this so we can all get back to Mountain View before sunset.) Unfortunately, this means that Caltrain won't be able to reach Mountain View in time for our rides after Metcalf, so if you're taking the train to get to us, I hope you'll be able to find some other transportation. Also, let me take a couple minutes to tell you about another big event I'm producing later this year. Different Spokes San Francisco is presenting Double Bay Double 2, a two-day, 208-mile ride to benefit the San Francisco AIDS Foundation. This year's event takes place Saturday and Sunday, September 29 and 30. Last year, DBD1 was an amazingly fun weekend that riders and volunteers alike enjoyed and spoke highly of afterward. In fact, it often felt like one of our Mountain View training rides, just a lot longer. We ride 108 miles (rain or shine) on the first day from Mountain View to Santa Cruz and onto Marina, we spend the night at a hotel in Marina, and then we ride 100 miles back through Salinas, Gilroy, and San Jose on our way back to Mountain View. Except for Highway 1 from San Gregorio to Santa Cruz, and a few miles around Marina, the route is different from what you'll ride in ALC. If you're familiar with the foundation's Seismic Challenge, DBD is very similar in distance and difficulty to the original two-day format of Seismic. But the foundation has decided to discontinue Seismic, so I hope to help fill the gap with DBD2. One big difference is that DBD riders are expected to be self-funding, buying their food along the route (or bringing it) and paying for their own lodging. The big win for the foundation is that they incur no event overhead, which means that every fundraising dollar goes directly to SFAF programs and services. Again this year, the foundation is being very supportive, and they're setting us up in Convio just like ALC, so the fundraising interface will be almost exactly what you're used to with ALC. Our fundraising minimum will be only $300 for each rider this year. Registration for DBD2 is expected to open sometime in the next few days. We limit the event to just 50 riders (that's smaller than today's training ride, by one person! ), so it's a relatively intimate event where you'll get to see a little bit of everything that the region has to offer. (That also means that the event could easily fill quickly this year.) Check the event website for details. You'll find many of the same smiling faces that you've come to know on our training rides! Just 99 days until we ride out in ALC11! Thanks for being part of AIDS/LifeCycle, and I hope you can join us in two weeks for Metcalf. Meet time: 8:30 a.m. Note the earlier meeting time! In case of light to moderate rain, we will ride an alternate route that allows us to end our ride early if conditions worsen. We will attempt the Pacifica ride again on March 31. From our starting point in downtown Mountain View, we're heading all the way up the Peninsula and down to the coast at Pacifica. You'll be treated to amazing views on our final descent to the coast, you'll enjoy the change of pace as you ride through Pacifica, and you'll be challenged by the moderately steep climb up Sharp Park Road back to Skyline. We'll also get some experience riding on the bicycle-legal parts of Interstate 280 -- something you need to get used to because there is a non-trivial amount of freeway and expressway cycling between here and Los Angeles. Our helpful ride leaders and SAG drivers will be on hand to help you succeed with grace and style. Strava reports about 5,100 feet of climbing for this route. The distance and climbing on this ride are very close to what you'll experience on Day 1 of the event in June (and this ride even includes some parts of the Day 1 route), so this is a good opportunity to gauge your progress in getting ready for the big ride. Day 1 usually has the most climbing of any of our seven days. Sorry, but our rides are now too early for Caltrain riders. We hope you can still join us! If you are arriving by VTA light rail, we're about four blocks from the station. Strava is a wonderful training tool. I've used it for almost a year, I've recommended it to other ALCers, I pay for its premium service, and I've grown quite fond of it. But, like so many other things, too much Strava can be a bad thing. Taking a break at that Starbucks means that you accumulate resting time in the middle of the Alameda Dash, which pretty much eliminates any chance of setting any speed records. And yesterday, I was riding strongly enough on Alameda that I could feel I might be setting a personal best. As I approached Avy, the traffic signal turned green, and I made a quick decision that I would forgo the rest stop in hopes of beating my old time. I reached the Sand Hill intersection feeling rather good about my time. Of course, I wouldn't know until the end of the ride whether I'd set a personal best. But then as I turned onto Junipero Serra and pedaled along Foothill Expressway for about the millionth time, I started to get grumpy. I didn't enjoy the motorists, the other cyclists, the beautiful springlike weather, my new bike's shifting, or pretty much anything else. By the time I reached the official ride end in Sunnyvale, I'd worked myself into an impressive dander, and I didn't exactly relish another 5.5 miles of cycling in city traffic to get back home. And, yes, I did set a personal best on Alameda, beating my previous best time by 16 seconds. Was it worth it? Of course not. We are always reminded that AIDS/LifeCycle is "a ride, not a race." Websites such as Strava can easily put you in the mindset of competing against others -- or even against yourself -- and this can lead to behaviors that aren't necessarily best for training to do events such as ALC. Like most tools, Strava can be used in many ways. When I see how I compare to other riders in Strava -- and I see that I rarely get much above the average time -- that can be depressing. But when I compare my own performance against rides of three, six, or nine months ago on the same segments, I can find much to be proud of. If you are a naturally competitive individual, tools such as Strava can nudge you toward unhealthy or unwise behaviors. Try to be aware of this when it's happening, and evaluate what's best for you in the long run. Quite frankly, I am impressed. Today's route wasn't just challenging; it was very challenging, and our group of 40 riders handled it with grace. Not everyone rode every mile, but that was never the intent. Instead, many of us found our limit and then reacted appropriately. And knowing one's limit is a very powerful thing; it's something you can revisit later, it's a measuring gauge for yourself, and it's a powerful lesson in managing your body and mind on endurance events. Of course, big thanks also go to today's SAG team of Chris, James, and Diana, who were there when we needed them and made the day ever so brighter. The good news is that we only needed to transport one cyclist in a SAG vehicle, and that was because they had chain issues. How 'bout that Joaquin? There's nothing even remotely like that on the event in June! In fact, there's nothing even remotely like that on the rest of our Distance Training rides. So, why the blazes did we go up Joaquin today? Well, first, it's quite the scenic ride, isn't it? (And for those of you who love big descents, that was quite the descent.) But also, for some of us -- including some of us who don't normally test our limits on these rides -- that was our limit. Whether you made it all the way up without stopping, took one or two (or six) breaks on the way up, walked part or all of the way, or skipped it altogether, you now have a benchmark of your ability as it stands at this point in your training. If you turned the corner and your head filled with dread when you saw the incline, that's not unlike where your head can go during the event in June. All sorts of things can happen, and when they do, you need to take a quick and honest assessment of where you're at and how you plan to deal with it. This isn't only for your benefit; it's for the benefit and safety of the 2,500 other riders around you. If you press forward in a degraded mental state, you're more likely to do stupid things, and that could endanger both you and others. Never be afraid to give the thumbs-down signal if you've truly gone off into Queen B*tch land and can't get back. As our season progresses, I'll talk more about riding EFI (for Every Friendly Inch, of course), the pressure that some feel to do so, what happens when you can't (even through no fault of your own), and why ALC isn't really about EFI anyway. There was only one thing I saw today that somewhat displeased me, and I saw it more than once. Out in the middle of nowhere, I saw a few folks fail to stop completely at stop signs. Yes, some of the stop signs seemed inconveniently or illogically placed. But rules are rules, and the full-stop rule is one that ALC takes very seriously. In past years, we have received many complaints in towns where our route has many stop signs. Even out in the middle of nowhere in the Salinas Valley, we encounter stop signs. Unless law enforcement is there to wave us through, we stop every time, and we always make a full stop. And if you think nobody saw you, so it doesn't matter ... well, I saw you from afar, but I just as easily could have been a local resident itching to complain about ALC. Please, please, please -- for your own safety and the future of ALC, always come to a full ALC stop at every stop sign, everywhere, without exception. What's next? From now until May, our distance increases quickly -- about 10 miles every ride. Our next ride is on February 25 and it's 59 miles. 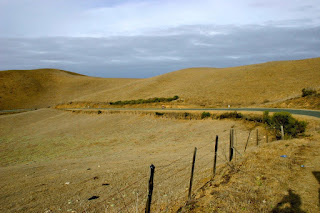 This ride is a rather simple route up the Peninsula to the Crystal Springs area. It's certainly hilly -- it has about as much climbing as we did today, but it's spread fairly well over the entire route. There's only one somewhat nasty hill: Alameda de las Pulgas westbound from Belmont. But we never get much about 500 feet in elevation all day, so it should feel much more mellow than today's ride. Details and RSVP are here. Thanks for a great ride today, and thank you for being part of AIDS/LifeCycle.